Master bedrooms are a sanctuary, a retreat where to escape from the hectic world and have some time in privacy with your partner. Unquestionably, they reflect the personality of the owners and are just the right place to keep those mementos, which truly have a very special meaning for each and every couple. However, there are some must-have décor elements that each bedroom should include. A comfortable bed, quality linens, layered lighting, comfortable extra seating, and ample storage should be definitely an integral part of master bedrooms. In addition, as bedrooms are synonymous with tranquility and serenity, these spaces should be predominantly painted in the owners’ favorite soothing hues. However, when it comes to creating a peaceful bedroom, sea, ocean, and earth tones are the usual favorite choice. Consider also including a mirror, bedside tables, a rug, and some luxury items to treat yourself. Generally, try to keep your bedroom uncluttered. Forget about TVs and hi-tech devices, they can’t help to create a relaxing atmosphere, just on the contrary. Unquestionably, beds are the natural focal point. Try to choose comfortable beds, which offer functionality, storage, appeal, and visual interest. With so many options available on the market, your choice depends entirely on your needs, taste, and preference. Whether a contemporary platform bed, a four-poster one, a sleigh bed, or a bed with an iron frame, with or without a headboard, with a built-in storage or not, a king size or a queen size option, it should fit well into the overall design scheme of the space. In the picture above, an inviting neutral master bedroom with adequate natural light and comfy seating. A gorgeous rattan bed, matching lampshades, botanical prints, and potted flowers add to the organic vibe of the space. Wood nightstands offer storage. An area rug adds coziness and appeal. Invest in a high-quality mattress, which looks and feels comfortable, after all, we spend about 6 to 8 hours in bed daily, so the investment is well worth it. Although relatively expensive, memory foam options are a contemporary solution to consider. Opt for quality bedding, it creates a sense of coziness, adds touches of luxury, and helps have a restful, healthy sleep. Focus on Egyptian cotton bedding sets. Soft and durable, it is definitely the epitome of style, luxury, and comfort. Whether white, neutral, or in bold, rich colors, bedding is an option to beautifully dress your bed and add some extra personal touches to your bedroom. Always consider throw pillows, they are an easy and affordable way to add color, texture, and visual interest. Note that depending on the size of the bed, the right amount of throw pillows is from three to six. Above shown, an awesome bedroom bathed in natural light. An Egyptian cotton bedding set with floral motifs adds an organic feel, touches of comfort and luxury, and extra visual interest. Generally, in any space, lighting is a key element for adding functionality, visual interest, and glam and creating the needed atmosphere. For a well-lit room, opt for just the right balance between natural and artificial light. Layered lighting helps meet all needs. Usually, overhead sources offer general lighting. Task lighting should be positioned near closets and reading nooks. Consider using lighting to accentuate architectural details, pieces of art, collectibles, or favorite décor items. In bedrooms, focus on dimmers and soft lighting, they offer a way to create a soothing atmosphere. From chandeliers to sconces to table and floor lamps to pendants, recessed lighting, and track lighting, the options in terms of designs, materials, sizes, and colors are literally endless, the choice depends on the taste of the owners and should fit into the design scheme and style of the room. When possible, choose designer, statement lighting, it can definitely add tons of personality to any bedroom. 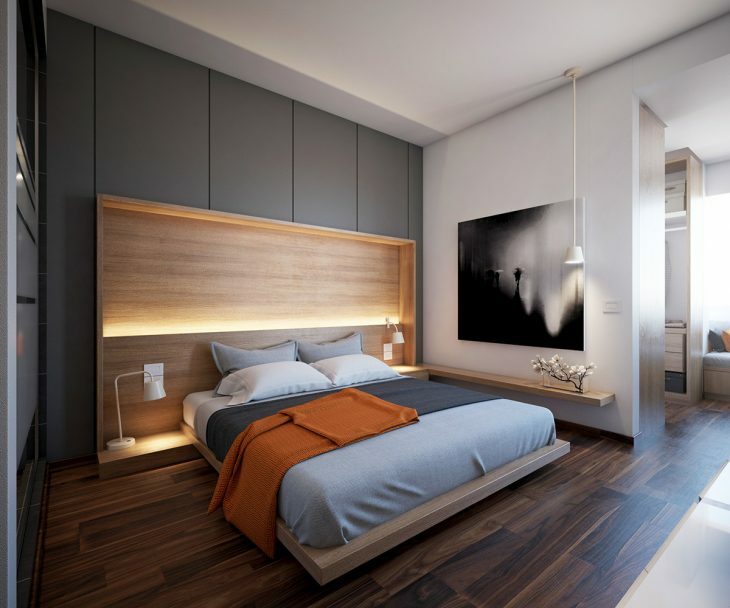 In the above-shown picture, recessed lighting in the middle of an oversized headboard adds touches of modernity and uniqueness to this contemporary master bedroom of minimal design. Matching table and wall lamp and a pendant offer task and decorative lighting and bring extra visual interest. 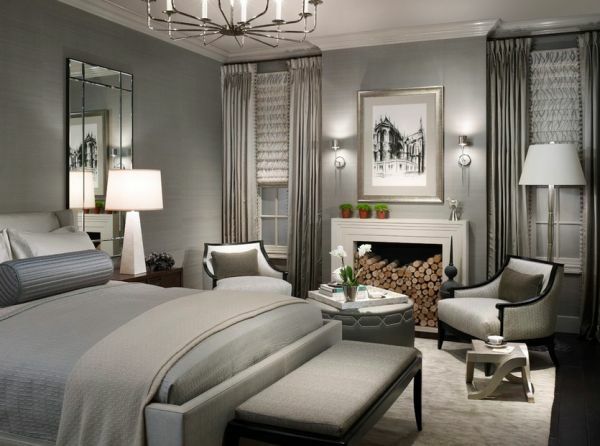 Above, an exquisite master bedroom in gray. Layers of lighting offer adequate artificial light and definitely take this space to the next level. Consider incorporating candles, they provide a wonderful option to add some extra lighting, charm, romance, and touches of mystery. Whether scented or not, arrangements of candles of different size, shape, and color make statement décor elements and create warm, inviting spaces. In the picture above, a contemporary bedroom with a distinctive architectural character and layered lighting. A pair of candles softens the look of the space and brings undeniable charm and romance. On a side note, creating a bedroom that offers tranquility and darkness is of key importance for a healthy sleep. In this regard, as it provides light and sound control, homeowners should carefully choose bedroom window treatment. Usually, a layered approach/blinds and curtains/ is a favorite option. Above, in this fascinating master bedroom, blinds offer light and sound control, while curtains add color and pattern and complete the look of the space. As a clutter-free space is a prerequisite for creating an atmosphere of calmness and comfort, bedrooms should have plenty of easy accessible storage. Even without a walk-in closet, with some creativity, planning, and furniture pieces that meet the specific needs of the owners, each bedroom can have a designated place for everything. Whether built-ins, dressers, armoires, credenzas, or nightstands, the choice depends on the available space and design scheme of the room. Actually, from customized storage towers to ladder-style shelving units to open shelving to benches, headboards, and ottomans with hidden storage to under-bed storage, bedroom storage options are a matter of creativity and a smart use of space. In small bedrooms, make the most of every inch of space and opt for narrower multi-functional furnishings, space-saving solutions, and a variety of storage types. Note that beautifully displayed jewelry can add color, visual interest, and personality to any bedroom. 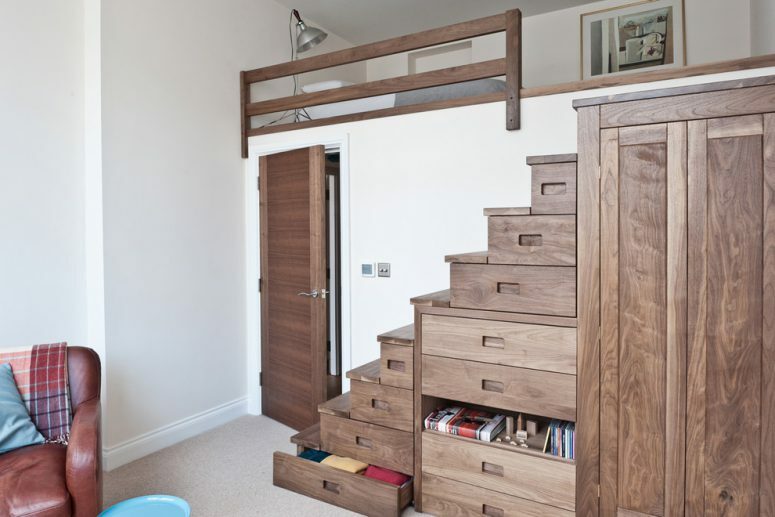 In the picture above, a small bedroom with a mezzanine sleeping space and a unique storage solution. The use of the under-bed space is definitely pure creatively! So much storage in such a tiny space! Truly impressive! Any bedroom definitely needs some seating for reading and other activities and this doesn’t mean the bed, it is for sleeping only! If the room is large enough, a seating area, which includes armchairs and/or chaise lounges complemented by an elegant table can do the job. When possible, organize window seating nooks, they offer a charming way to add functionality and personality to any bedroom. If the bedroom accommodates a fireplace, the seating area can be organized in front of it. For smaller spaces, upholstered benches at the foot of the bed, comfortable upholstered armchairs, cozy chairs, and ottomans are options to consider. For really small bedrooms, storage ottomans, which serve double, are a favorite solution. Generally, opt for versatile seating that adds to the functionality and appeal of the space. 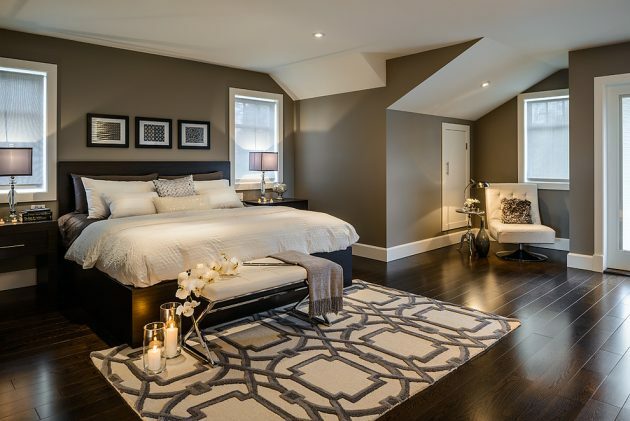 Above, a fascinating neutral bedroom with a comfortable seating area. An upholstered bench at the foot of the bed adds extra seating. An eye-grabbing chandelier adds glam to the space. Focus on area rugs or carpets, they add warmth, color, visual interest, texture, and appeal, always help create cozy, inviting spaces, and soften the look of the room. Incorporating, if possible, beautifully framed full-length mirrors/especially in smaller bedrooms/ creates a sense of space and adds touches of glam. When it comes to master bedroom décor, opt for items that you love, make you calm and happy, inspire you, help you relax, and add personal touches to the space. Favorite pieces of art, photographs, and tastefully positioned mementos both enliven the room and complete its look. Generally, some little luxuries, from a silver tray to a warm throw blanket to flowers to scented candles, can make any master bedroom feel like a dream-come-true retreat. 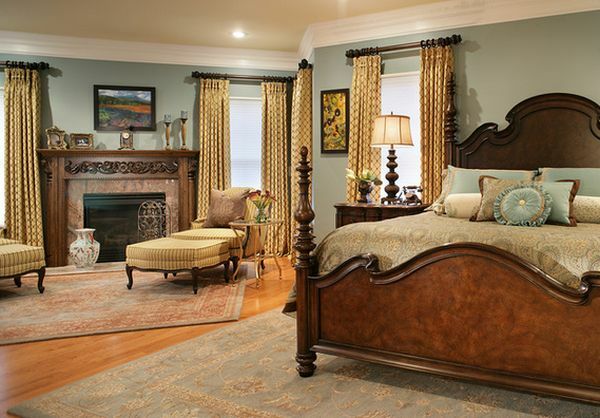 In the picture above, a traditional master bedroom, which exudes warmth, coziness, and elegance. A stunning embellished bed, a comfy seating area in front of the fireplace, area rugs, luxury bedding, pieces of art, layered lighting…What a space! Flowers add color and freshness. Truly a spectacular bedroom! As a hideaway from the stresses of everyday life, master bedrooms should stimulate relaxation and calmness. So, apart from the basics/a quality bed, bedding, layered lighting, and a comfortable seating area/, they should include those little luxuries that help their owners unwind and make them happy.